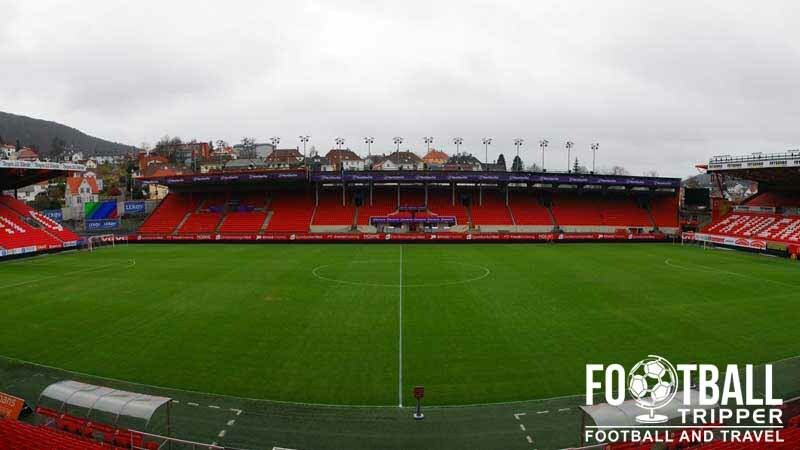 Brann Stadion has been the home ground of Norwegian Premier League team SK Brann since 1919, and unsurprisingly today’s 17,686 capacity stadiums bears little resemblance to the once which first opened just under 100 years ago. 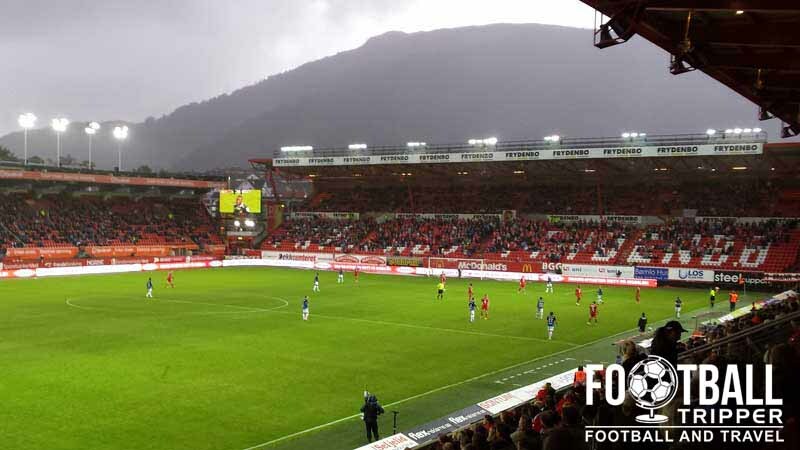 Located in the city of Bergen, the Brann Stadion is approximately 3km south of the city centre. in the semi-final of the Norwegian Cup. 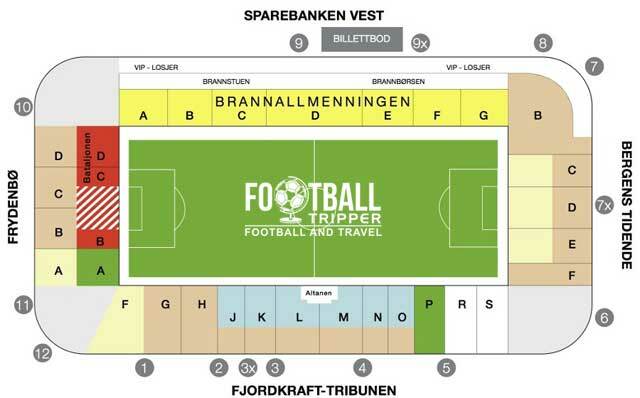 Brann Stadion is comprised of four stands: North, East, South and West. Away fans (Bortesupportere) are housed within sections R and S in the south-stand as per the white sections in the above seating plan. Official merchandise of SK Brann can either be purchased online from the webshop or from the club shop at Brann Stadion which is open during the working week. On matchdays the fan shop opens from three hours before kick-off and then again for roughly thirty minutes after the full time whistle. Whilst it doesn’t appear as if tours are available of Brann Stadion you could always scales Mount Ulriken by cable car as part of the Ulriken643 Panorama Tour which offers some breathtaking views of the city and its harbour. 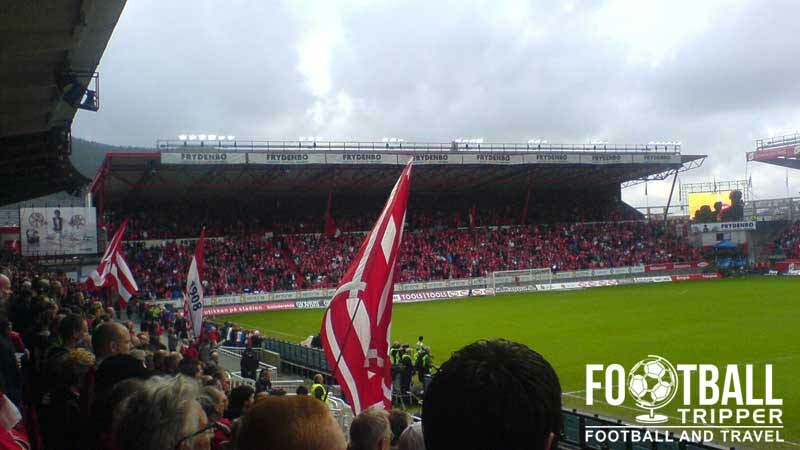 Tickets to see SK Brann play at home Brann Stadion can either be purchased online in advance of the match, from the fan shop, or at the various ticket booths around the stadium which open on matchdays. Be advised that the above priced are merely illustrative and can change slightly per fixture. Brann Stadion sits approximately 4.0 km south of the historic city centre which received UNESCO’s World Heritage status a few years ago. For any Football Trippers who are accustomed to walking you can make your way to the ground in the best part of 50 minutes. Despite being located out of town there doesn’t appear to be much parking available at the stadium itself. Bergen Railway Station is located in the city centre and thus isn’t very practical for those looking to travel to Brann Stadium. The typical grey and cloudy weather you will likely encounter within Norway! You can travel to the stadium via the light railway which is basically a single-track tram. You can get on from places in the city centre such as Byparken or Bystasjonen although the way to the Brann Stadion stop. Bergen International Airport is located within Flesland less than 20 km from the city centre. Upon landing you can catch one of the numerous shuttle buses to the city centre. 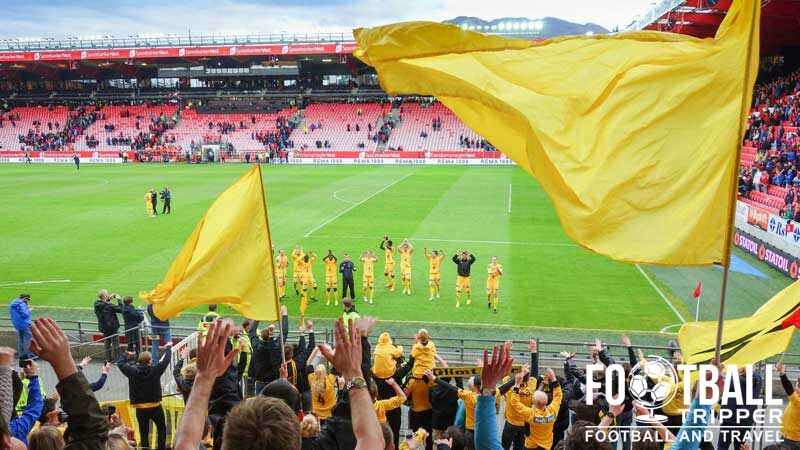 There aren’t any places to stay within the area of Minde where Brann Stadium is situated which means you will have to look to the harbour area for most of Bergen’s accommodation options. Three well-priced options are Thon Hotel, Radisson Blu, and the no thrills basic hotel Bergen.